More than 1 million people suffer whiplash injuries each year and about 10% of those end up with chronic pain that affects their daily activities. 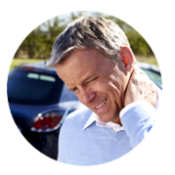 Spinal injury, especially the neck region, are common in motor vehicle crashes. Very often, the symptoms may be present immediately after an accident or they may slowly begin to develop over hours or even days. Although neck and/or shoulder pain is the most common symptom associated with whiplash injury, other symptoms may include headaches, neck swelling, muscle spasms, numbness or tingling into your arms, nausea, difficulty swallowing, dizziness, and blurred vision. Whiplash injuries may include a variety of related problems, such as joint dysfunction, disc herniation, faulty movement patterns and chronic pain. Chiropractors are trained to diagnose and treat many of the injuries that are typically associated with whiplash. We will perform a thorough history and physical examination, may request x-rays or other imaging if necessary, to make sure we understand the types and severity of your injuries as well as how they are impacting your lifestyle. Whether or not you have painful symptoms, if you’ve experienced whiplash it’s a good idea to see a chiropractor as soon as possible to make sure you don’t have any hidden issues that could cause future health problems. Our goal is to help quickly reduce pain and mobility issues while always carefully considering your long-term health. We start with a thorough evaluation to make sure we understand the types and severity of your injuries as well as how they are impacting your lifestyle. We’ll do everything we can to see you on the same day you call when you’ve been in an accident. Call or email our office today!